Cheesy broccoli, topped with a crunchy bread topping. Yum! Note: Roasted broccoli has a dry texture. 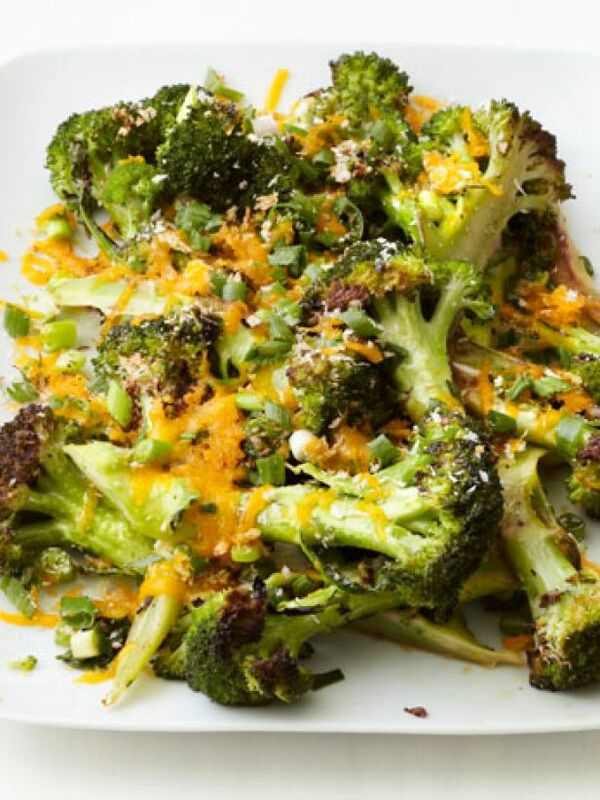 If you prefer a moister broccoli, steam the broccoli, then continue with tossing in olive oil and finish in a 350° oven for 10 minutes, or until cheese is melted and crumbs are crispy. Cut broccoli into long spears. Toss with 2 tablespoons olive oil on a baking sheet; season with salt and pepper. Roast at 450° until almost tender, 15 minutes. Toss 1/2 cup breadcrumbs (preferably panko) with 1 cup grated sharp cheddar, 1 bunch sliced scallions, 1 tablespoon olive oil and a pinch of nutmeg. Sprinkle on the broccoli and roast 15 more minutes.